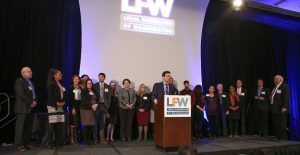 On Friday, February 23rd at the 2018 Goldmark Award Luncheon, we presented the Charles A. Goldmark Distinguished Service Award to the Washington State Attorney General’s Office (AGO) and Northwest Immigrant Rights Project (NWIRP) for their outstanding work combatting the Trump Administration’s travel ban, supporting immigrant and refugee communities, and defending the fair and just rule of law. 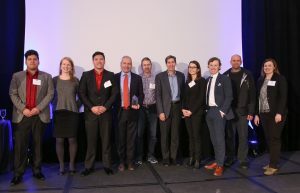 Jorge L. Baron, NWIRP staff, and two NWIRP clients took the stage to receive the 2018 Goldmark Award. Washington State Attorney General Bob Ferguson and his team accept the 2018 Goldmark Award. 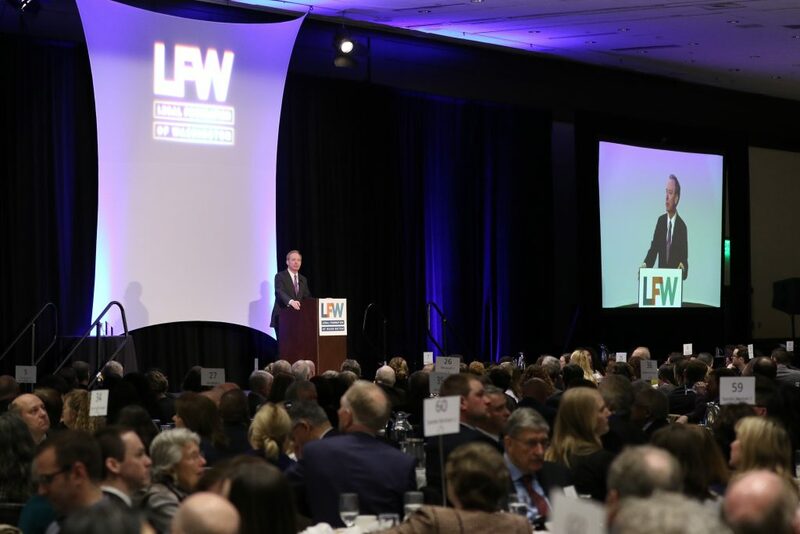 The event was the largest Goldmark Luncheon in LFW’s 34-year history with almost 900 people in attendance. The luncheon raised a record breaking $404,000 for civil legal aid. For the first time corporate sponsors Alaska Airlines, the Seahawks, Expedia and Amazon joined Microsoft, T-Mobile, Starbucks, and many law firms in a strong showing of support to advance justice in Washington State. Brad Smith delivers an inspirational and powerful speech to a packed house about the importance of access to justice. Charles A. Goldmark Distinguished Service Award commemorates the extraordinary contributions of founding LFW Board member Charles A. Goldmark who played a singularly important role in the creation of a critical funding source, the Interest on Lawyer Trust Accounts (IOLTA) program, designed to complement state and federal funds that provide low-income people in Washington state with access to the civil justice system. Since the inaugural Goldmark Award Luncheon in 1987, the Goldmark Award has recognized over 39 individuals and groups for their leadership and instrumental work in advancing equal justice.